I’ve got a bit of a procrastination problem when I’m working from home, I find it easier to concentrate during the evening rather than during the day for some reason! During the day I find myself doing non-work related things from my to do list instead of my work to-do-list! Thankfully due to the nature of my work I can do it in the evenings as it’s not strictly office hours, but I’d rather save that time for blogging and chilling out. I thought that it would be better if I made myself a proper work station rather than sitting on the sofa with my laptop on my knees and notebooks and things spread all over the place! I also have to be really careful where I leave pens, notepads and diaries as I have a very inquisitive toddler and a pre-schooler who loves to scribble on important things! Back in the summer my husband found me a bargain wooden bureau at a car boot sale for a measly fifteen pounds! I had been watching and bidding on some on ebay over the past few weeks prior to his bargain find, and they all went for ridiculous amounts of money! The desks are from habitat and Ikea, I like the idea of the taller one but it would depend on the amount of space I could make in the attic room! Angled lights would help when working late into the night, and every desk needs some pretty containers to help keep things neat and tidy! I love the ladder style shelves to keep bits and bobs neat and tidy, with a plant and some picture frames too of course for the personal touch! 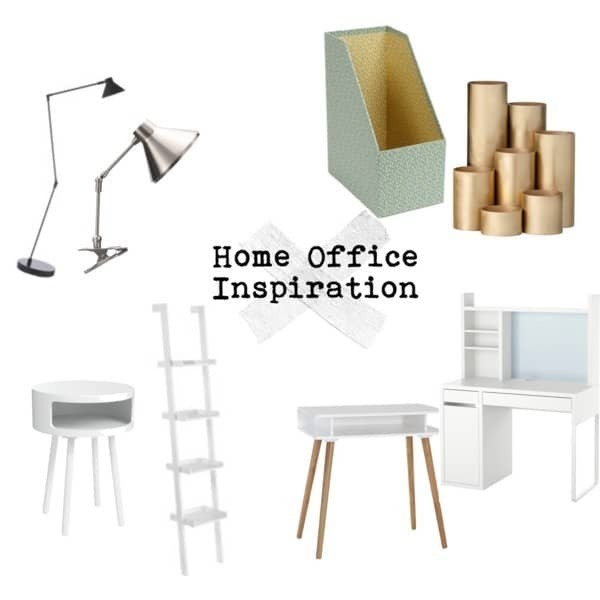 Perhaps one day I’ll be able to have a proper home office, maybe a shed in the garden or a proper loft conversion. There are companies that can help with the design and installation like Innova Solutions, making the best use of space and guiding and assisting with all the important decisions using their knowledge and experience! Previous Post Festive Gift Guide: Secret Santa and hard to buy for! Am renovating my home office and wanted some cheap and nice stuff,i guess I have found it.Thanks for sharing.